The drow mercenary Jarlaxle finds an unlikely ally--and an even more unlikely savior--in the ruthless assassin Artemis Entreri. Jarlaxle is in possession of the dreaded Crystal Shard, but the demonic artifact is too powerful even for him, and too malignant even for Entreri. Their first order of business is to destroy the indestructible, then journey thousands of miles to the north where their quest for power and legitimacy will shine a light on the darkest corners of their pitch-black souls. 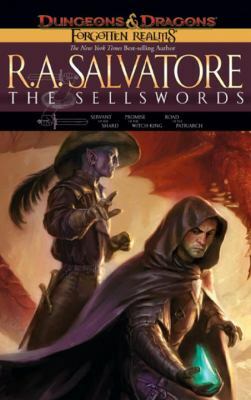 Three tales of action and adventure in the Forgotten Realms(R) world, based on characters and situations from the Legend of Drizzt(R), "The Sellswords" is a great value-priced omnibus that collects the complete text of all three novels: "Servant of the Shard, Promise of the Witch-King, " and "Road of the Patriarch."